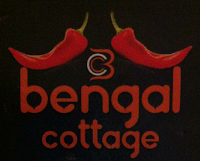 On Friday my friend Denise from Living in BL told me about a fabulous meal that she had at a new restaurant in Horwich called Bengal Cottage. We love indian food, so couldn't wait to try it out! They only opened this week, so I wanted to see what was going down. I booked a table for 6pm on Saturday night. The restaurant looks clean, tidy and has clearly gone through some refurbishment since the building was Halay (and the Red Onion and Pascale's before that). The staff were buzzing around making sure everything was ship shape, and were quick to greet us on arrival. They took my coat (my friend Wayne reckons this is a mark of a quality establishment...) and sat us down. We didn't have to wait long for drinks, and menus were produced almost instantly. When we were ordering, we had a nice chat with one of the chaps who worked there. He was really knowledgeable about all the food, and very complimentary about the skill of the chef. He explained that everything is cooked from scratch with no base spices or sauces. In fact, all of the staff were really pleasant and chatty. It's clear that they are all eager to make this business a success, but for all the right reasons. I broke with tradition for the first time ever. Chicken Tikka Massala was on the menu, and I decided against it... mainly because there were so many other tempting things on offer! 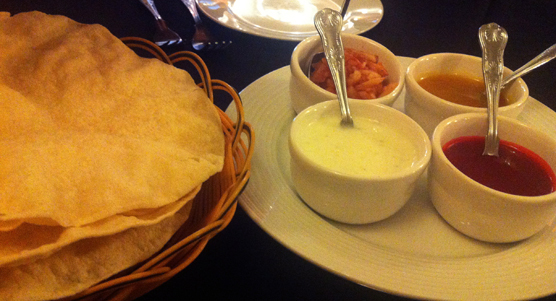 We had some poppadoms and pickles and a Bengal Cottage Special Starter for two. 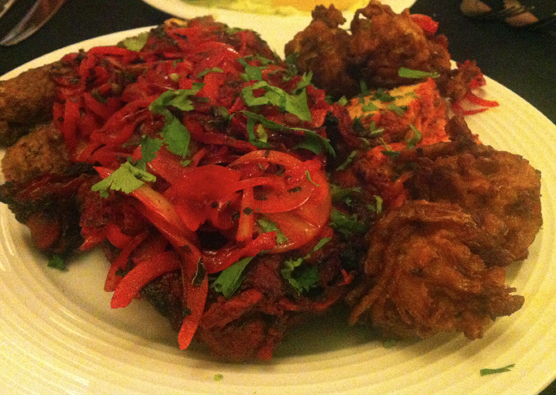 This included two lamb tikkas, two chicken tikkas, one tandoori chicken, two sheek kebabs and two onion bhajis. The red dip in the pickle tray was amazing! When I asked what it was, I was told that it was the the chef's special recipe. I asked what was in it, and the chap responded with a giggle 'I have absolutely no idea, he won't tell us!' Just know that it's really good! The starter comes covered with soft onions (cooked in spices which turn them red) which were delicious! They also come with a side salad. 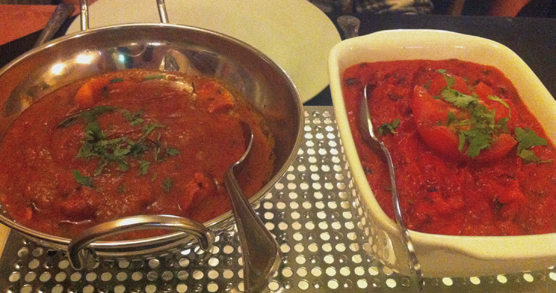 For our mains we had Chicken Tikka Madras and the Chef's Special Bhuna Massala. These can be cooked however you like them, ranging from mild to 'blow your socks off'. The special bhuna is one of the nicest flavoured currys I have had. It is a mixture of chicken tikka, lamb tikka and tandoori king prawns in a special bhuna massala sauce with ground almonds (I omitted the prawns as I don't like them). 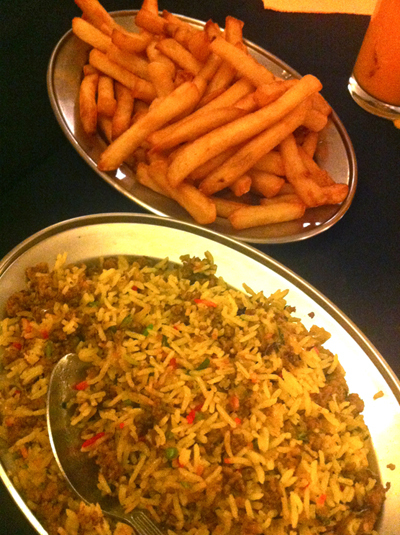 We had them with a mixture of crispy chips and keema pilau rice. 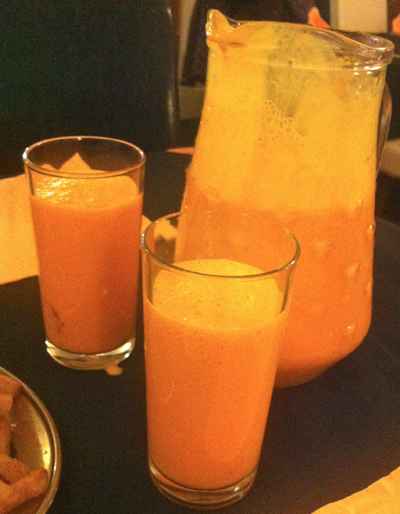 I have a real thing for lassi, and always ask for it when I go to an indian restaurant. It's a blend of yogurt, sugar and sometimes fruit. I opted for my favourite which is mango. It didn't appear for a while, then I was told that the chef wasn't happy with his mango! He had sent one of the lads out to see if he could source another! I felt terrible... When it came (with profuse apologies) it was lovely! Rich in colour and flavour and light in texture. Lassi is particularly good with a hot curry, as the yogurt takes away some of the heat. 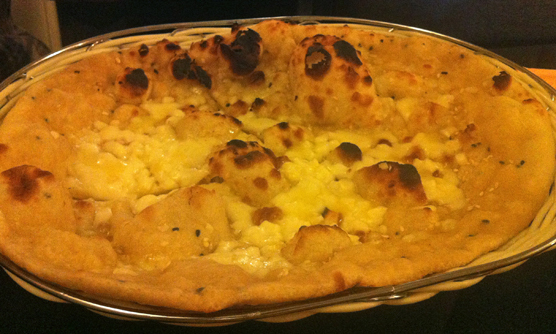 My own personal mark of a quality curry house is whether or not they do cheese naan bread. Sajaan, legendary Horwich Indian restaurant of yesteryear (RIP) did the best cheese naan in the entire world, so I have to have it if it's on the menu. This one had plenty of cheese, was soft and huge! It was also conveniently cut into four. We both had a really enjoyable evening for two reasons; great food and friendly, knowledgeable staff. I urge you all to try Bengal Cottage! The food really is brilliant and the staff are great too. We are definitely going back. If any of you know East to West in Bolton, this is owned by the same husband and wife team. He has moved to be the chef here and put his head chef in place at the other restaurant. Oh and Wayne and Kev - I just need to note here that they do Funky Pie. Find them on Facebook here. I believe they will be on Twitter shortly. They are at 80a Lee Lane, Horwich, BL6 7AE. The also do free home delivery on orders over £10 within a three mile radius. Pop your comments or questions below! arrgh can't believe i've only just read this we've just come from horwich we could've gone there! looks great. didn't realise Halay had closed though :-( yay for funky pie! We really enjoyed it. You must try it some time! Just ate there tonight. Really really good food! Good atmosphere (finally a contemporary Indian restaurant in Horwich!) and great staff too :) BUT... didn't have room for dessert!! Simon Rogan's Great British Menu at Rogan and Co.
What do you do with too much cake mix...? Calendar Cakes - New Blogger Challenge!